Home staging high rise apartments should always take advantage of beautiful panoramic views and showcase the unit from both indoor and outdoor perspectives. High rise buildings offer unique living for people located in the middle to upper floors. There is nothing like the experience of living so high up and enjoying views that seem to go on forever. It is no surprise that home stagers have developed many special strategies for showcasing high rise units in order to get them rented or sold for the most money possible. The ability to build higher and higher continues to evolve, allowing residential units to reach the clouds. Since height in a building is considered both an asset and a status symbol, upper floor units are always at an advantage in the competitive real estate marketplace. However, when staged to perfection, these properties can be sold or rented even quicker and for more money than comparable unstaged units. This guide provides practical advice on staging high rise apartments, coops and condos for sale or rental. Saleable apartments in high rise building are always in great demand, particularly if the building offers a luxurious lifestyle and affords residents stunning views. The sky is the limit when it comes to pricing the most desirable high rise units in the residential real estate market. Staging can always decrease the time it takes to sell and increase the price paid for the property. Therefore, it is a natural fit to always stage high rise properties prior to selling them in order to maximize profitability from the transaction. Staging will facilitate universal appeal for every unit and will often create bidding wars on the best properties. Staging statistics demonstrate the general success of aesthetic marketing efforts, but in high rise apartments, the benefits are even greater, often surpassing the average financial rewards of a typical staged property being sold. Listing agents for high rise units will usually insist on professionally staging each property to provide it with special character and appeal that will speak to its ideal buyer. In New York, where I lived and worked, it was unheard of for any high rise apartment to be listed for sale with a comprehensive marketing and staging plan in place. The return on investment was always handsome and most listing agents would refuse to accept properties that were not staged, since their time commitment might not pay off in the long run. 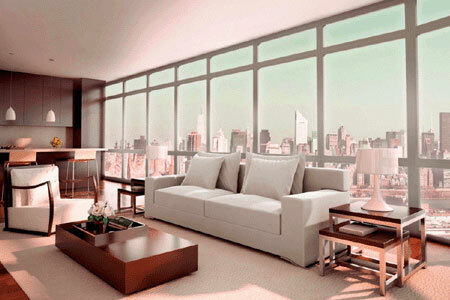 Many high rises are staged with the option to keep the furnishings as part of the sale. This can increase profit for every party, including the seller, the real estate agent and the staging firm. It is no surprise that in major real estate markets like New York, Los Angeles, Chicago and Miami, staging transcends simple decor fixes and often becomes a complete professional design overhaul. High rise rentals also typically enjoy the many benefits of staging before being offered to prospective tenants. Once again, these units are often designed and furnished by top professionals in the industry and then offered fully outfitted in order to really wow buyers and optimize the monetary gain of the seller, stager and agent. Staging luxury rentals has become the norm in most major property markets. Landlords and management companies realize that staging attracts better quality tenants, brings in more money and facilitates longer lease terms from each transaction. Many professional landlords and property management companies even employ their own stagers to maintain and perfect all the offerings in their real estate portfolios. In these cases, the investment in staging furniture, art and props can be used over and over again to prepare multiple properties for rental or can be included in the price of the unit to bring in even more income each and every month. Either way, the investment in an in-house staging division helps many property firms to beat their competition in more ways than one. The choice or decor can either complement or contrast against the style of the building. Either approach can work well, depending on several factors. I would not suggest staging a unit traditionally in a modern or contemporary building. However staging a modern or contemporary unit in an older style building is very popular and appealing. If there is a view available, it should be maximized using every attribute of the staging. Buyers should be naturally guided towards windows and outdoor spaces by the flow of the unit’s decor and all views should be showcased from each room where they are present. The view might become the focal point of several rooms, since this is the unique selling point offered by high rise living. Make sure not to do anything to obstruct available views with window treatments, furniture or placement of interior items. Likewise, be sure to leave any available outdoor space open and airy so that prospective buyers can enjoy the scenery from multiple angles. Be sure to account for and market the amenities offered by the building itself. Making a visual display in the unit reflecting the amenities offered is great and works particularly well with a high-tech approach, such as a laptop computer or electronic picture frame offering a slide show of building perks. If the building does not offer many amenities, be sure to provide some counterbalance to this negative factor by playing up monetary saving in the way of lower common charges. When staged to perfection, few properties offer more desirability than high rises. This is amplified if their views are amazing and exponentially magnified if they also offer panoramic city or waterfront views. Do everything to enhance your property investment before rental or sale and make it work efficiently for you. After the transaction is finished, any extra work invested will surely pay off handsomely.